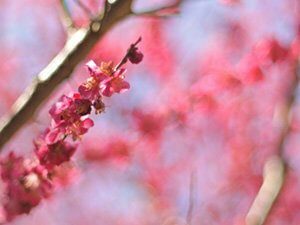 Umegasane is a bright reddish color like a red plum blossoms overlapping. Kasane’s color name derived from the Heian era’s Costume costume, as the color of Kasane’s “Table · Kokibeni, Back · Koubai” it is a color scheme representing the overlap of red flower flowers, from November to February I was wearing it. Speaking of plum blossoms in general, it is sometimes white, and there is another theory called “Umegasane” expressing the overlap between white plum and red plum in “Table · Shiro, reverse side · Koubai”, but in the late Heian period As Kasane Irome of “Masasuke Shouzokushou” wrote by Minamotono Masasuke of the workman can also see Kasane of Koubai, the color of the reddish red will be powerful as expected. Combination in a similar color that makes accentuate in the light “Usukoubai” kimono with a brilliant “Umegasane” belt was called “Nioi” in the traditional color scheme. By the way, we call “Nioi” a gradation that arranges a dark color on top and makes the color thinner as going downward.